This "recipe" has an odd title that might turn you off, but really, it's one of my mom's many ways to use leftovers. 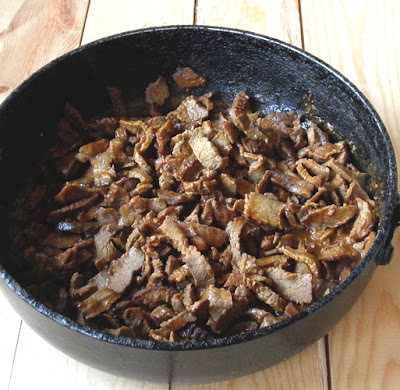 If we happened to have leftover steak, Mom would slice it up thin, cook it in taco seasoning, fry up some taco shells and presto! A yummy dinner. 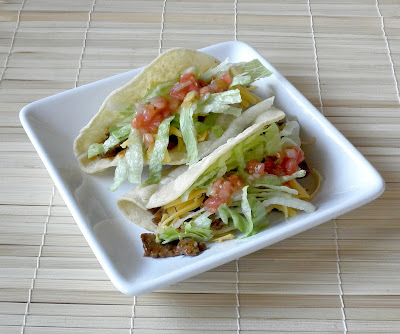 Now, like several other of the recipes you'll find here on this blog, these tacos involve frying. My mom fried a LOT when I was growing up. I mean, I grew up (in Southern California, mind you) thinking that all burritos were fried in oil and that all quesadillas (called "cheese burritos" by my mom) were fried in butter. No, Mom was not afraid of frying. She's eased up a little on that action, but some of my favorite recipes from her do involve frying. At least I use canola oil now days rather than solid Crisco. Gosh, my mom is a good cook. So, you can use this taco meat for burritos, soft tacos, or store-bought hard shell tacos, but below is the recipe for how I like them best. The way mom used to make them. taco toppings like cheese, lettuce, tomatoes, etc. If your steak has remaining seasonings from the first round meal, rinse it off in cold water. Slice steak very thin across the grain and cut into 1/4 inch strips. Place in a shallow pan, add water and taco seasoning according to package instructions (I actually use less seasoning per pound because the meat is already seasoned a little bit and because I just like a little less seasoning). Bring to a boil and then simmer over low heat for 15 to 20 minutes. While meat simmers, bring about a half inch to an inch of canola oil up to 375 degrees Fahrenheit in a pan you're not afraid to fry in. Line a plate with paper towels to drain shells once fried. With tongs, place a tortilla in the oil. Immediately flip the tortilla with the tongs and then fold in half. 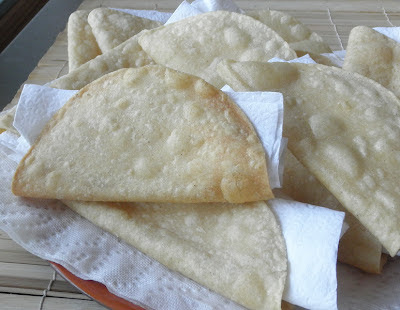 If space allows, you can quickly do this with another tortilla. Fry on each side about 45-60 seconds, or until edges start to curl a little. Fry less for softer shells, longer for more crisp shells. (Be aware, though, that if you make them too crisp, they'll just break when you put the meat in.) Remove shells to prepared plate. I also like to fold a paper napkin and push it into the shell to absorb any oil from the interior. This is optional. Repeat with remaining tortillas. Make more shells if you have more meat. Fill each taco with about a quarter cup of the meat. Top with desired toppings and enjoy! I love it. I love getting inventive with leftovers. I found this searching for steak recipes. Since discovering grass fed beef, I've been serving it more and do have leftovers. Excellent. Thanks for letting me know how you found the recipe. What's interesting is that I just posted the recipe about an hour ago and it's already showing up in a search. I love it. I've heard grass fed beef is fantastic. I think I need to give it a try.